Babolat have been producing top quality tennis rackets for many years now. They really came to light however after the sponsorship of Rafa Nadal and is meteoric rise up the ATP rankings. Never has a single sponsored player been responsible for such enormous growth in the tennis brand. His stylish looks, all round play on the court made him a firm favourite with a huge audience. Even household names like Roger Federer cannot claim to have had such an impact on the sales of a brand. Once Nadal made it to world number one, every kid wanted to be seen with a Babolat tennis racket and likewise wanted to be kitted out with Babolat tennis shoes and clothing. The brand wasn’t just about kids though, as our sales of adult Babolat tennis rackets went through the roof too. So coming back to the present day, one of our favourites from them has to be the Babolat Pure Drive tennis racket range. 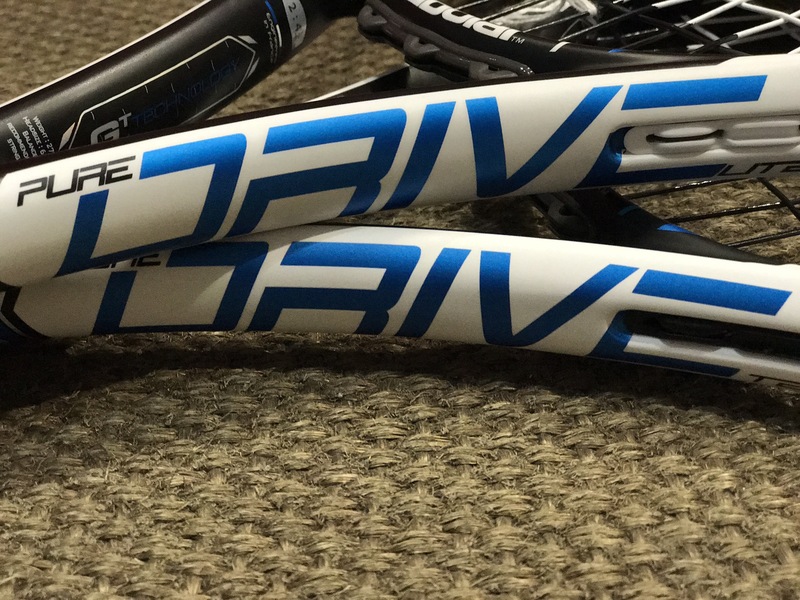 The pure Drive is an easy racket to play with, is very forgiving thanks to the cortex system and with 3 models within the Pure Drive range there is a racket to suit all types of player. I’m sure many of you are now asking, what is cortex? Without getting overly technical and trying to complicate matters, Babolat developed the cortex system to improve the overall feel and playability of the racket for those off centre shots that we all inevitably play. It takes me back to a few years ago when I went through a series of weekly tennis lessons over the six month period using one of the top end Prince rackets. As the weeks went by I could feel an improvement in my game. So after 6 months of lessons, it was at the half way stage of one of those lessons that I switched over to the Pure Drive GT model that weighed 300gms. It was a total revelation, as by simply switching rackets mid way through that lesson, my game improved drastically. Those off centre shots that made my Prince racket vibrate just a few minutes before, were now pinging off what felt like the middle of the racket with my Babolat Pure Drive GT. The cortex system was absorbing all the bad vibration and letting through just the good vibration, so that the natural, ball to racket feel wasn’t lost. Let alone the superior feel that I got from the racket myself, even my coach for 6 months commented on how my shots had improved by simply switching rackets. So coming back to what is actually available in the Pure Drive, Babolat have created a range of rackets racket suitable to all types of players. The Babolat Pure Drive GT weighs in at 300gms and is suited typically to male players who are confident about their game and don’t want a racket that’s too heavy and can give them a good amount of control and power. It’s also suited to ladies who once again like a little more weight in their racket and have a strong game. The Pure Drive GT Team weighs in at 280gms and is one of our best selling models. To make it as simple as possible, this is a very easy racket to play with. The slightly lighter weight suits men and ladies as well as junior who play a powerful game and need some control on their shots without having to opt for a heavier frame that tires them out quickly. Then at the lighter end of the spectrum we have the Babolat Pure Drive Lite which at 240gms is the perfect ladies racket as well as those juniors that are making thier way up from a junior racket, to thier first senior tennis racket. Once again the cortex system works wonders and gives this racket a great feel. All our Babolat tennis rackets are supplied with a free full size racket cover, so why not pop into our store or order your new racket online and take advantage of our free delivery service on all orders over £75.